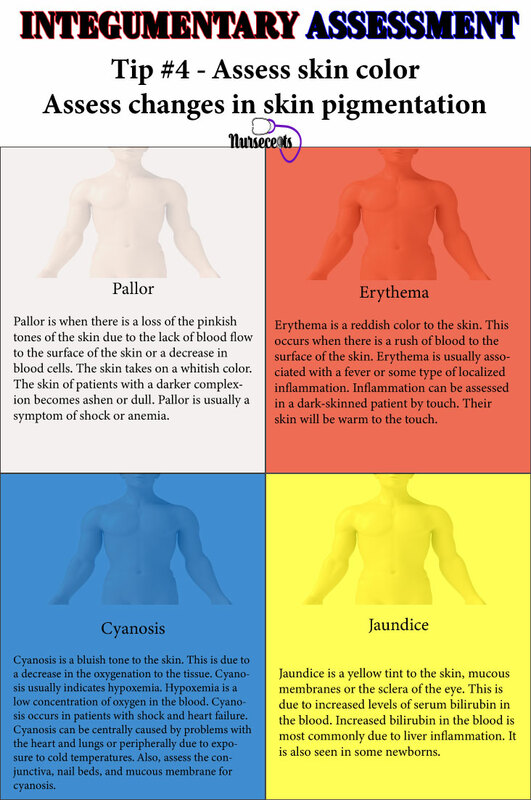 The integumentary system protects the body against pathogens, regulates body temperature, provides sensory input and synthesizes vitamin D. Assessment of the integumentary system involves gathering data about the skin, hair, and nails. In gathering information about the integumentary system, a good inspection and a detailed description from the patient is required. 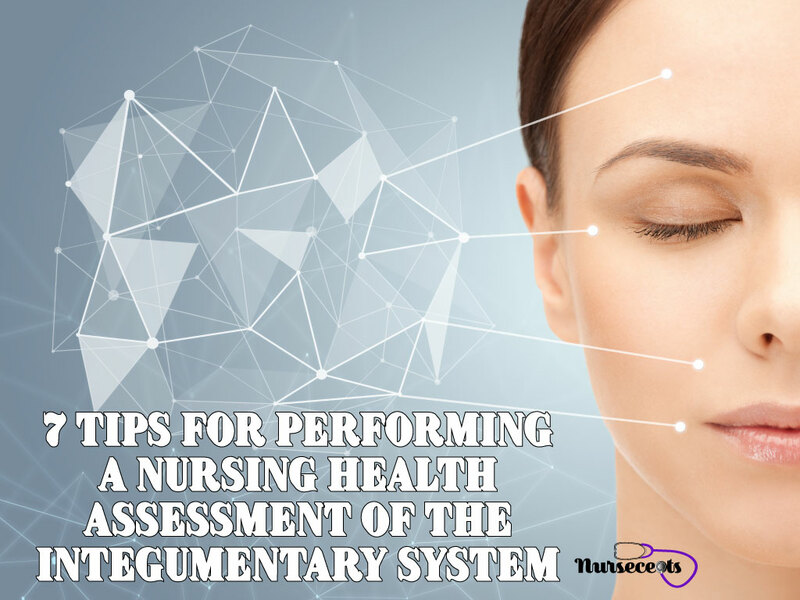 This article contains 7 Helpful Tips for Performing a Nursing Health Assessment of the Integumentary System. To begin the study of assessment of the integumentary system, review your anatomy and physiology of the system. The procedure for performing an assessment of the integumentary system involves interview questions, inspection, and palpation. Assessment of the skin is not a separate assessment but is done throughout the head-to-toe assessment. 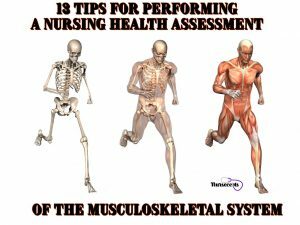 For more information read this article Tips for A Better Nursing Health Assessment to help you proceed through an assessment including the skin as you move from head-to-toe. Have you ever had a skin infection or disease? Have you ever had an allergic skin reaction? Do you have a family history of allergic skin reactions? A patient’s history of specific complaints and symptoms associated with the skin, hair, and nails are important. The questions should elicit responses about the onset, duration, and frequency of symptoms. Below are some questions to ask patients to begin to gather information on chief complaints and symptoms of the integumentary system. Ask the following questions about the skin. Are you having problems with your skin? Is your skin drier than usual? Do you have any sores or lesions on your body? Do you have sores or lesions that do not heal? Have you noticed any excessive bruising? Do you have any lesions, bumps, bruises or spots on your skin? Do you have any tender or painful areas on the skin? Have there been any changes to the size shape or color of a mole? Do you have an area that drains or weeps? Do you use anything to treat any skin condition? What medications do you take? Some skin problems may be due to medication. Ask the following questions about the hair. Have you noticed any changes in your hair? Have you noticed any hair loss? What over the counter medications do you take? Which products or appliances do you use to style your hair? Do you use any chemicals on your hair such as perms, bleach or color? Ask the following questions about the nails. Have you noticed any changes to your nails? Are your nails dry, brittle, split, chipping or peeling? Do you have any pain to your nails? 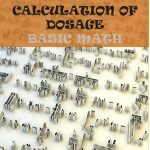 Which over the counter medications do you take? Normally do you wear nail polish? Do you spend a large amount of time with your hands in water? Ask the following questions about pain. Do you have any pain or discomfort to your skin? Have you noticed anything specific that causes this pain? Is there any treatment you have tried to relieve the pain? A lot of people shy away from being touched by strangers, so touching the patient’s hand as you explain what you are about to do may help the patient feel more comfortable with the assessment in general. Also, performing inspection and palpation at the same time is a more efficient way of working through the integumentary system assessment as you proceed from head-to-toe. Tip #4 – Inspect the Skin for Color. First, inspect the overall appearance of the skin. Inspect the skin for color. Look to see if the patient’s skin tone is the same all over the body. You are looking for areas of hyperpigmentation and hypopigmentation. If any lesions, moles or rashes are noted, identify the characteristics. When assessing the skin of different ethnic groups, remember that the different skin tones may affect the results of the examination. When assessing the color, you are looking at the skin tone. People have different genetic makeups that affect their skin tone and undertones. Skin color can range from pinkish to dark brown. Some undertones include reddish, orange, yellow and olive. People with dark brown skin tend to have a lighter pigmentation to the lips, palms of the hand and the fingernail. A normal benign pigmented area may include a freckle, a mole, and a birthmark. Freckles are patches of melanin pigmentation that occur normally or when the skin is exposed to the sun in some patients. These patches depend on the patient’s distribution of melanin. These patches are usually small and flat. Moles also are known as a nevus and are an excessive growth of melanocytes. They are usually small, smooth and symmetrical. Moles range in color from tan to dark brown. Birthmarks are flat areas of discoloration that are usually brown or tan. Also, a change in pigmentation can affect the entire body. These skin discolorations include pallor, erythema, cyanosis, and jaundice. In patients with darker skin, these skin discolorations may be hard to determine. If you suspect a problem, assess the mucous membrane in the mouth and the sclera of the eye. Pallor is when there is a loss of the pinkish tones of the skin due to the lack of blood flow to the surface of the skin or a decrease in blood cells. The skin takes on a whitish color. The skin of patients with a darker complexion becomes ashen or dull. Pallor is usually a symptom of shock or anemia. Erythema is a reddish color to the skin. This occurs when there is a rush of blood to the surface of the skin. Erythema is usually associated with a fever or some type of localized inflammation. Inflammation can be assessed in a dark-skinned patient by touch. Their skin will be warm to the touch. Cyanosis is a bluish tone to the skin. This is due to a decrease in the oxygenation to the tissue. Cyanosis usually indicates hypoxemia. Hypoxemia is a low concentration of oxygen in the blood. Cyanosis occurs in patients with shock and heart failure. Cyanosis can be centrally caused by problems with the heart and lungs or peripherally due to exposure to cold temperatures. Also, assess the conjunctiva, nail beds, and mucous membrane for cyanosis. Jaundice is a yellow tint to the skin, mucous membranes or the sclera of the eye. This is due to increased levels of serum bilirubin in the blood. Increased bilirubin in the blood is most commonly due to liver inflammation. It is also seen in some newborns. Explain to the patient that you will be assessing the skin as you proceed through your assessment. Use the back of the hand (dorsal surface) to assess the patient’s skin temperature. The patient’s temperature should range from lightly warm to slightly cool. Some patients’ hands and feet may be normally cooler. Begin with the forehead and assess as you move from head-to-toe of your assessment. Palpate down the body following your sequence for your head-to-toe assessment. Compare the skin on the right and left sides as you move down to the feet. The temperatures on both sides of the body should be equal. The skin should not be overly moist or overly dry. Inspect the amount of moisture in areas where perspiration is normally noted. This includes the face, palms of the hands, and skin folds. Profuse sweating is called diaphoresis. 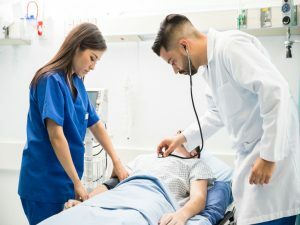 This can occur during a fever, exertion or when a patient is in pain. Dry skin will have a weathered look. You will note sloughing of skin cells. Patients with dry skin may have pruritus. Pruritus is itchy skin. Palpation is used to assess for texture. Use the palm (palmar surface) of the hand and the fingers to palpate for texture. The skin should be smooth and firm. Skin that is rough may indicate a problem with keratinization. This is when the epithelial cells lose their moisture and become dry. Scar tissue will be depressed and feel smooth. Palpation is used to assess for skin thickness. Use the palm (palmar surface) of the hand and the fingers to palpate for thickness. Skin is normally thin and firm over most of the body. The skin on the palm of the hands, the sole of the feet, knees, and elbows is normally thicker. The skin should be elastic and mobile. Turgor is the ability of the skin to return back to normal position when stretched. Assess turgor by gently grasping the patient’s skin between your finger and thumb, then release it. The skin should spring back into place. When the skin springs back, the turgor is normal. When the skin holds its position and slowly returns to normal, the turgor is decreased. Decreased skin turgor is caused by conditions such as dehydration. Skin that holds its position and slowly returns to normal position is known as tenting. Turgor is increased in conditions such as scleroderma when the connective tissue of the skin is immobile. 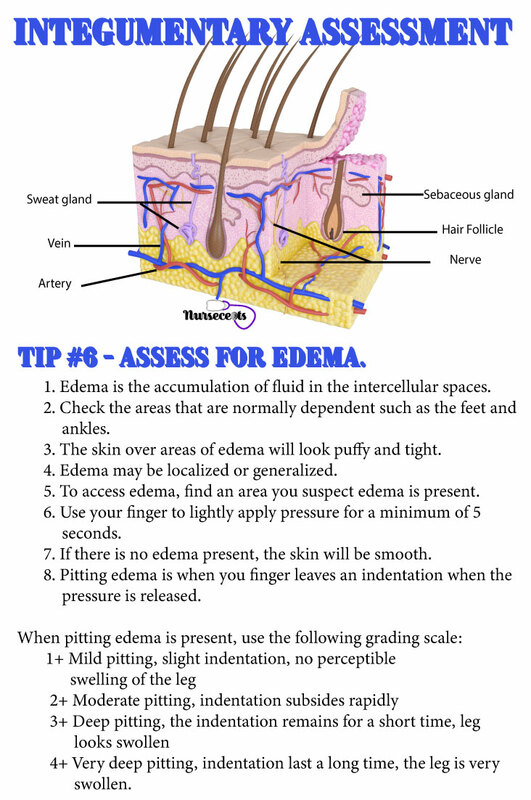 Tip #6 – Assess for Edema. Edema is the accumulation of fluid in the intercellular spaces. Check the areas that are normally dependent such as the feet and ankles. The skin over areas of edema will look puffy and tight. Edema may be localized or generalized. To access edema, find an area you suspect edema is present. Use your finger to lightly apply pressure for a minimum of 5 seconds. If there is no edema present, the skin will be smooth. Pitting edema is when you finger leaves an indentation when the pressure is released. 4+ Very deep pitting, indentation last a long time, the leg is very swollen. Taken from Jarvis, C. (2008). Physical Examination and Health Assessment. 5th ed. St Louis Mi. Saunders. Tip #6 – Inspect and Palpate the Nails. Explain to the patient that you are going to check their nails. Check to see if the nails are well groomed and clean. Patients with poorly groomed nails may suggest a self-care deficit problem. Nails that appear bitten, are very short or have a jagged edge may indicate a nervous habit. The nail, the nail fold, and nail edges should be smooth. Assess the contour and shape of the nail. Assess the surface of the nail looking at the profile of the nail. The profile is the side view. Some patients’ nails may be flat and some may be slightly round. The angle of the nail should be 160 degrees or less. Assess the nail for clubbing. Clubbing is when the angle of the nail is greater than 160 degrees. This occurs with hypoxia over a long period of time. To assess the nail for clubbing, have the patient bring two nails on opposite hands with the dorsal side of the hand (top of the hands) facing each other to create a mirror image. Normal nails should create a diamond shape opening at the nail beds. When a patient has clubbing, the fingers will not create a diamond shaped opening but instead, create a V-shape as the distance between the fingertips is increased. 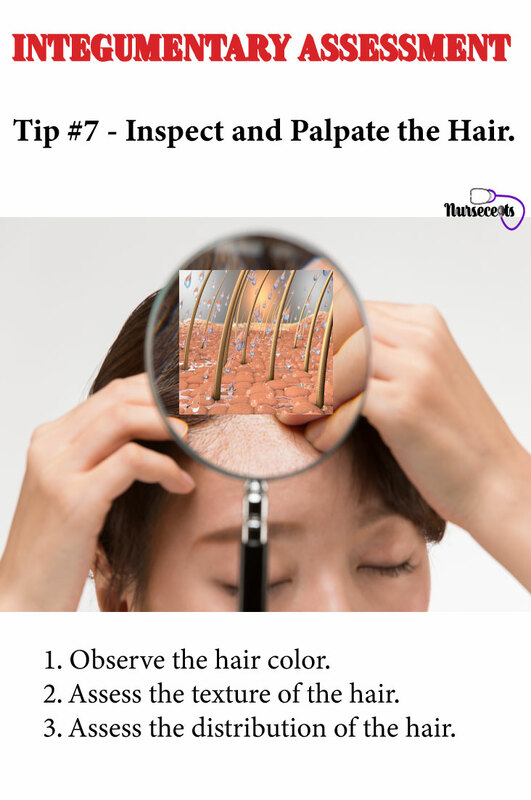 Tip #7 – Inspect and Palpate the Hair. Explain to the patient that you are going to check their hair and scalp. Ask the patient to remove accessories and wigs. Part the hair in small sections and examine the scalp. Lesions or sores may be present on the scalp. Check the hair for cleanliness. Check the scalp for dandruff. Dandruff is dead flakes of epidermal cells. Some patients with psoriasis may have a large number of dead skin cells that have sloughed off. Hair color will vary among patients. Most graying is normal depending on the patient’s age and genetics. Some patients may gray as early as their teens. However, sometimes graying can be the result of a nutritional deficiency. Assess the texture of the hair. Take a few strands of hair between your thumb and finger and roll the hair. Next, take a few strands of hair between the thumb and finger of one hand near the end and use the opposite hand to slide your fingers down the length of the hair. The hair may have a texture that is thick or fine. The hair may also be straight, curly or wavy. Patients that have a metabolic or nutritional problem may have hair that is coarse, dry, or brittle. Assess the distribution of the hair. Check to see if there is even distribution of the hair throughout the scalp. The thickness or thinness of the hair will depend on the patient’s age, gender, and overall health. Inspect the scalp for lesions. 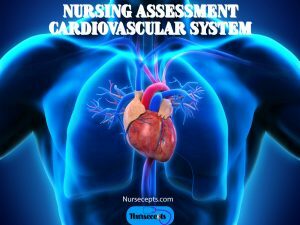 In conclusion, the tips above will help you with a nursing health assessment of the integumentary system. Remember to integrate the skin assessment into the total head-to-toe assessment. Use inspection and palpation as you move through your assessment.